Mammography services are a critical part of physics services nationwide, and ISS, Inc., is well-qualified in mammography systems. Initial mammography equipment inspections and annual inspections, as required by the Food and Drug Administration under the Mammography Quality Standards Act. Whether your facility is using digital systems or film/screen systems, ISS, Inc., has more than 40 years of experience in solving imaging problems. We are able to provide suggestions for design and equipment layout to optimize the efficiency of your facility. We provide shielding designs for mammography suites which are required in many states. 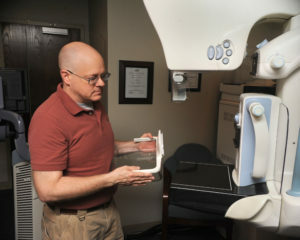 Initial mammography equipment inspections are required before any patient images can be taken. Any equipment deficiencies discovered during the initial equipment survey must be corrected before patient images are made. The equipment must function according to the manufacturer’s specifications before you accept it, and our medical imaging consultants team can provide accurate, reliable help with this task. Before your annual physics inspection is due we will contact you to schedule our visit. Your equipment may require repair for malfunctions during the 12 months between physics inspections. Many times a retest must be performed by the physicist before the equipment can be used to image a patient. We strive to respond to your call as soon as possible, usually the next day. This shortens equipment down time and reduces patient waiting. You may have issues with mammography image quality. We provide support for problems in film/screen and digital systems. Through many years of providing physics support for mammography, we have gained the experience which allows us to assist the technologist and service personnel in solving problems. Read more about areas we serve. “I particularly enjoy communicating with radiology professionals about the details of equipment performance and radiation protection.” – Steve Hale, ISS, Inc.